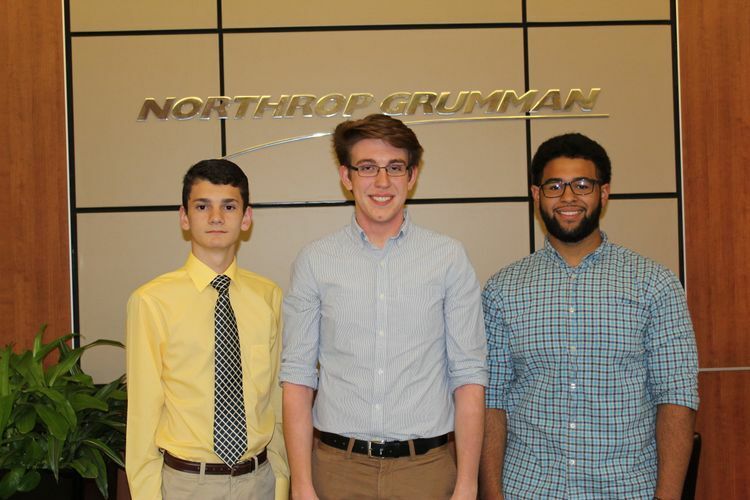 HUNTSVILLE, Ala. – Aug. 8, 2017 – Northrop Grumman Corporation (NYSE: NOC) has announced the winners of its first Engineering Scholars program in the Huntsville area. The program will provide college scholarships this fall to two graduating high school seniors interested in studying engineering, computer science, physics or mathematics. The first Northrop Grumman High School Involvement Partnership (HIP) participants in the Huntsville, Alabama, area are, from left, John Melancon of Columbia High School in Huntsville; Justus Welch, of James Clemens High School in Madison; and Jared Harris of Bob Jones High School in Madison. Each is assigned a company mentor and will visit the Huntsville facilities once a month for work on engineering and design projects during their junior and senior years. Upon completion of the program they will each receive a scholarship. Javier Nishikawa of St. John Paul II Catholic High School in Huntsville and Cade Boseck of James Clemens High School in Madison, Alabama, will each receive a merit-based scholarship for their excellent academic achievements and extracurricular activities. The $8,000 scholarships are payable in $2,000 annual installments over four years. 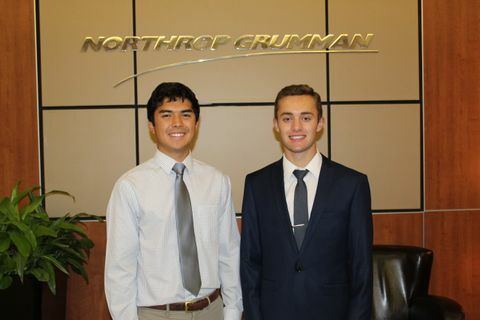 The two will also have paid summer internships with Northrop Grumman during their scholarship years. Nishikawa will attend Auburn University in Auburn, Alabama, and plans to study aerospace engineering. He is a National Merit Scholarship Finalist, a National Hispanic Scholar and was involved in student council, the National Honor Society and the culture club. He also ran on the school’s cross-country and track teams for four years. Boseck will attend the University of Alabama in Tuscaloosa, where he will pursue a degree in mechanical engineering. He enjoys researching and learning about cars and playing football and soccer with friends. A committee of Northrop Grumman employees in Huntsville selected the Engineering Scholars winners. To be eligible, each applicant had to be a resident of Huntsville, Madison or Madison County and be a graduating senior this spring from a public or accredited private high school in Alabama. Applicants also had to have a minimum composite SAT score of 1150 or ACT score of 27 and a minimum GPA of 3.5. The committee also took into consideration work experience, community involvement, leadership and athletics. These awards are part of a larger scholarship program for which the company is awarding $400,000 to 50 students living near Northrop Grumman campuses in 10 states around the country: Alabama, California, Colorado, Florida, Illinois, Maryland, New York, Ohio, Utah and Virginia. The Engineering Scholars program is aimed at supporting promising high school seniors who intend to pursue a career in an engineering-related field. Candidates must plan to attend an accredited college or university as a full-time student in an approved engineering, computer science, mathematics or physics program. The funds can be used for tuition, books, room and board, and lab fees. Northrop Grumman has also expanded its High School Involvement Partnership (HIP) program to the Huntsville area. Three students will each be partnered with a company mentor and will visit the Huntsville facilities once a month for work on engineering and design projects during their junior and senior years. Upon completion of the program they will each receive a scholarship. The area’s first HIP participants are Jared Harris of Bob Jones High School in Madison; John Melancon of Columbia High School in Huntsville; and Justus Welch, of James Clemens High School in Madison. Northrop Grumman and the Northrop Grumman Foundation are committed to expanding and enhancing the pipeline of diverse, talented STEM students globally. In addition to the HIP and Engineering Scholars programs, they provide funding to sustainable STEM programs that span from preschool to high school and through collegiate levels, with a major emphasis on middle school students and teachers. In 2016, Northrop Grumman and the Northrop Grumman Foundation continued outreach efforts by contributing $19.2 million to diverse STEM-related groups such as the Air Force Association (CyberPatriot), the REC Foundation (VEX Robotics), National Science Teachers Association, and the National Action Council for Minorities in Engineering.